Acupuncture is an old therapy using needles to stimulate energy flow in the body. It is one part of Traditional Chinese medicine (TCM). The old Chinese doctors primarily tried to influence the energetic equilibrium of the body by means of nutrition. Nutrition accounts for about 70% of all treatments in TCM. The next aspect is mobilization or just the right movement (as in Jiatsu). Acupuncture makes up about 10% of the therapeutic spectrum of TCM. For acupuncture very thin needles (today mostly stainless steel, very seldom gold- or silver-needles) are used. After locating the right point (often felt as de-qui-sensation) the needle is left inserted for about 20 minutes. In acute cases the treatment is repeated in short intervals (i.e. daily) whereas in chronic conditions many treatments in greater intervals are necessary. At the 25th Congress of IVAS (International Veterinary Acupuncture Society) in 1999 the US veterinarian Dr. Terry Durkes had a presentation on a therapy he used in modification of an earlier technique (since 1975) of his colleague Terry Young(✝): gold bead implantation. uses little gold beads which are placed into the accupoints. There they remain forever and stimulate the accupoint in response to any movement of the surrounding tissue. Thus only one treatment is necessary. Gold acupuncture uses this technique as a part of a holistic approach to the cure of chronic cases. Implantation of the gold beads is only the first step towards constant and steady amelioration of pain. To get the full effect of this therapy, the patient (that is here the patients-owner) has to understand how gold acupuncture works and how one can influence the body to react in the desired manner. Nutrition is the most important part of TCM because the ancient Chinese doctors knew already what modern physiologists tell us today: man is what he eats. The same principle can be applied to animals since the body functions are principally identical with those of humans. This complex and personal aspect cannot properly be addressed by a short text on a web-site. The next part is the knowledge of proper movement. Although it is possible that even after a disastrous looking x-rays or very painful joints, adequate function may come back, one has to be aware of the limits. Gold acupuncture thus uses gold bead implantation in conjunction with nutrition and movement. Only the combination of these three aspects of TCM can guarantee (as far as any medical treatment can be guaranteed) the positive longtime and often everlasting result of only one treatment. We use gold acupuncture mainly in chronic conditions of arthritis in animals. This illness often shows little or only pure response to conventional treatment. The administration of chemical pain-killers can help in those cases. But one has to consider the consequences. If the intention is only to provide a short painless period before the final step has to be taken there is no need of a discussion of side-effects. 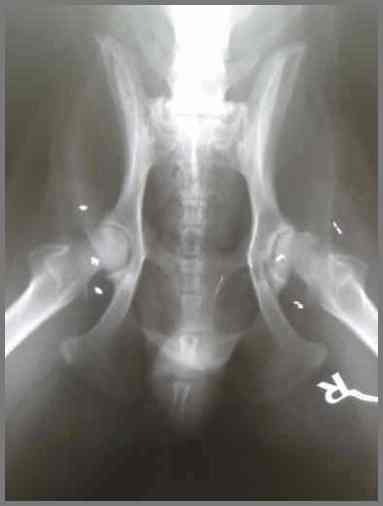 But if the animal is young (we can see malformed hips in six month old dogs) or an older dog still has lots of energy but can’t deal with it - then one should select a treatment with the least possible side-effects. Every drug has many effects, the one we wish to emphasize is the main effect (named among the indications) and we have to tolerate all the others (the then called side-effects). By the way: the same goes for any Homeopathic drug, but there we call a "right" drug the one which covers as many as possible conditions of a patients actual situation. Any therapy should try to work with as few side-effects as possible. If there is a highly effective therapy without any side-effect - why not choose this one? Here you find answers to some questions on gold acupuncture.